Jaleo: A Celebration of 10 Years with José Andrés | Exploring Food & Drink in D.C.
Let me just say, if I ever make a significant 10 year marker, I hope I can throw a party like Jaleo. 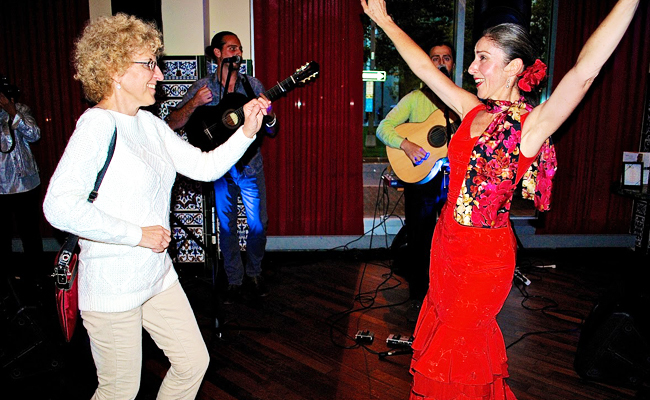 This past Wednesday was Jaleo’s 10 year anniversary in Crystal City, and boy, did people show up to enjoy the food,drinks, and atmosphere. 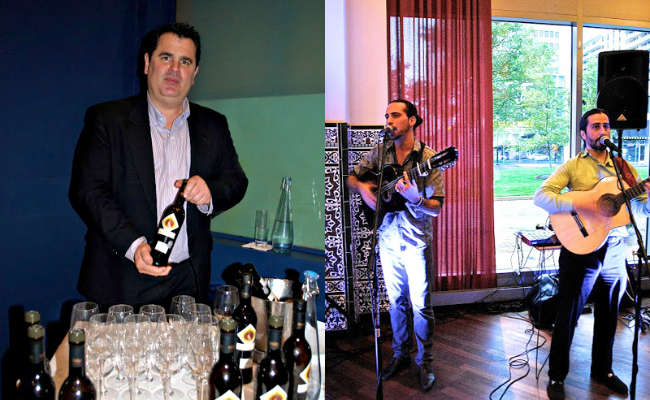 Jaleo invited guests to take a journey through Andrés’ native Spain with an evening packed with authentic tapas, demonstrations, and a live band band playing some great Spanish music. (Also, there was a live performance from Flamenco dancer Emily Mazzotti. While I tried to pick up some moves, she took away the show!) The restaurant was transformed into 4 distinct stations, Valencia, Barcelona, Sevilla, Santander, and Cadiz – each showcasing their unique flavors and specialties. Five dollars from each ticket sold for the anniversary party benefited World Central Kitchen - Andrés’ non-profit (inspired by his work with DC Central Kitchen) that helps developing countries in crisis build kitchens to feed the hungry with local ingredients. I spotted José Andrés , who was making sure the food was up to par, and my inner foodie swooned. (My outer foodie, instead, attempted to wave at him as if we were good pals. Sigh) The man only creates some our favorite dishes at our some of our favorite restaurants, plus, easily can be credited to bringing Washington’s restaurants to a whole new level. 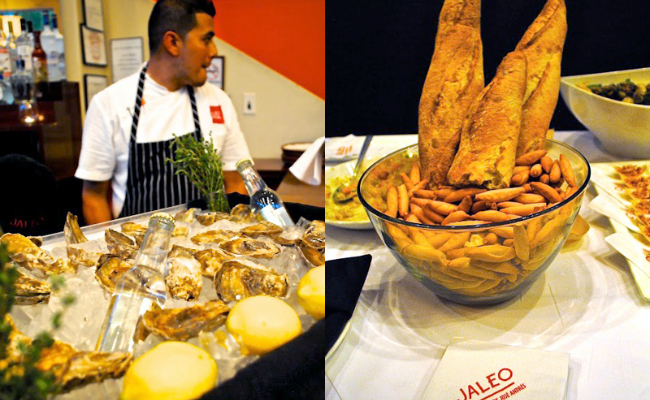 The event was packed with people, however, the Jaleo staff made sure that there was plenty of food to go around. Whether you got to the said food in time, that was another story, however, I was lucky enough to try many dishes. And try I did, from the Pan de crystal con Tomate (toasted slices of bread brushed with fresh tomato) , to the Arroz Meditteranea ( Mediteranean Rice) to even the Aceitunas ‘Ferran Adrian’ ( liquid olives). While trying all the different foods, much like the event, at times felt slightly overwhelming, three distinct dishes came to mind as our favorites. First, the Chistorra envuelta en pat at a frita, a slightly spicy chorizo wrapped in a thin crispy potato with membrillo alioli. If that reminds of you somehow of a hot dog wrapped in a potato chip, it was exactly like that except not at all like that. The flavor alone of the chorizo would be enough to knock your shoes off, and the crispy outside provided a perfect contrast in taste. Also, they were so easy to just grab and eat, that it took me a moment to realize that I was nearing a dozen. Second, was the Mini Flan. Yes, I know, it is not that surprising that a Spanish restaurant has incredible flan, however, it was one of the best flans I had ever tasted. The carmel was not overly cloying or powerful, instead the sweet flavor was only brought more with the amazing homemade ice cream. Lastly, and not surprisingly, what had me going back for seconds ( and thirds….and okay, okay, fourths) was Andres’ famous Paella con Pollo y Setas other wise known as a heavenly dish of traditional paella of chicken and mushrooms. Rich, and tenderly cooked, it left just a subtle after taste of spice. Which is all someone is asking for as they leave Jaleo. All in all, the event was a great reflection of how much Washingtonians have come to love José Andrés and the food culture that has undeniably grown here. However, next time I go, I hope it is just me, a table, and a bowl of unlimited paella. Tags: anniversary, arlington va, crystal city, jaleo, Jose Andres, world central kitchen. Bookmark the permalink.